The Gazprom Board of Directors appreciated the work being done by the company to implement its major investment projects. It was highlighted that the company continued to consistently develop the new gas production center in Yamal. Gazprom's resource base in the Peninsula is becoming key for gas supplies to domestic and foreign consumers over a long-term. This year, new gas wells and a booster compressor station will be put onstream at Bovanenkovskoye, Yamal's largest field in terms of gas reserves. Gazprom is expanding the northern gas transmission corridor meant for gas supplies from Yamal to Russia's central and northwestern regions as well as into the Nord Stream 2 gas pipeline for export purposes. In particular, construction continues on the linear part of the Ukhta–Torzhok 2 gas pipeline, with 688 of the 970 km completed, and the compressor stations at the Bovanenkovo–Ukhta 2 gas pipeline. In addition, the Company is retrofitting a number of gas pipelines in the Leningrad Region and this year is going to start building new capacities from the Gryazovets gas transmission hub to the Slavyanskaya compressor station (Nord Stream 2's main compressor station) currently under design on the Baltic Sea coast. The Nord Stream 2 project is proceeding on schedule. At present, work is underway to obtain national permits from Germany, Denmark, Sweden, Finland and Russia for the gas pipeline construction. Construction is in full swing on TurkStream, another new gas pipeline for Russian gas supplies to Europe. At the onshore section, drilling operations have been completed and pipes have been microtunneled. At the offshore section, a total of 373 km of pipes have been laid along the two strings. As part of its efforts to establish the gas industry in the east of Russia, Gazprom is active in pre-developing Chayandinskoye, the basic oil, gas and condensate field of the Yakutia gas production center. To date, 86 gas wells and eight oil wells have been drilled, and industrial, energy and transport infrastructure is under construction. 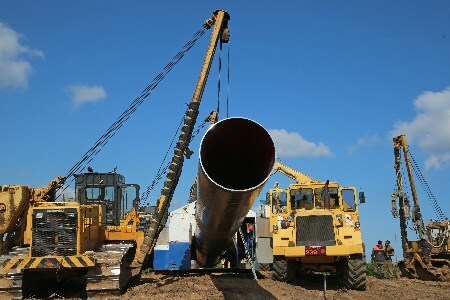 The Company has started to build a pipeline connecting Chayandinskoye to the Eastern Siberia–Pacific Ocean oil pipeline system. Preparations are in progress for the pre-development of the Kovyktinskoye gas and condensate field, the backbone of the Irkutsk gas production centre. Construction is ahead of schedule on the Power of Siberia gas trunkline that will convey gas from Yakutia and the Irkutsk Region to Russia's eastern regions and China. By now, the Company has completed more than 1095 km of the gas pipeline, which is 50.7% of the overall length of its paramount section from Chayandinskoye to Blagoveshchensk. Gazprom has moved on to the main stage in the construction of the Amur gas processing plant (GPP), which is an essential element in the technological chain of supplies via Power of Siberia. The company has launched construction and installation works at the GPP's key facilities – cryogenic gas separation units. Construction continues on a wharf on the Zeya River and railway communications. In parallel, work is in progress to develop the gas production center on the shelf of Sakhalin Island. Until the year's end, production drilling is planned to be completed at the Kirinskoye field. Upon the hookup of new wells, the field will be gradually brought to its design capacity of 5.5 billion m3/y of gas. Design works are underway with regard to pre-development infrastructure at the Yuzhno-Kirinskoye field. The priority activities of Gazprom include improving the reliability of gas supply to the Kaliningrad Region. Two new underground reservoirs are coming onstream at the Kaliningradskoye UGS facility soon. Until the end of 2017, it is planned to finish the construction of a liquefied natural gas receiving, storage and regasification terminal. The Management Committee was instructed to continue the efforts aimed at implementing the company's major investment projects.